PLEASE NOTE: This blog post contains sample pages from my Christmas Literacy Centers for Kindergarten packet. You can download the free sample pages by clicking on the photos. 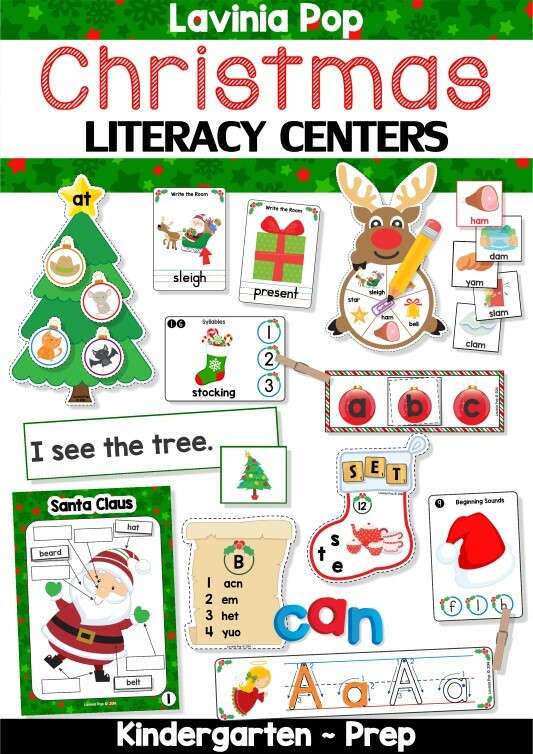 To purchase the complete Christmas Literacy Centers for Kindergarten packet, please click here! To prepare the cards for use, print, laminate and cut apart. Children are required to identify the missing letter and place it in the empty box. To prepare this activity for use, print the cards, laminate them and then cut them apart. Household pegs, or other small clipping items such as unused hair clips or paper clips, can be used for this activity. The aim is for children to identify the number of syllables in each word. To prepare this activity, print, laminate and cut out the sorting tree mats and ornament picture cards. The aim is for children to identify the ending for each word and sort it to the correct word family tree. You will need to provide children with magnetic or Scrabble letter tiles for this activity. 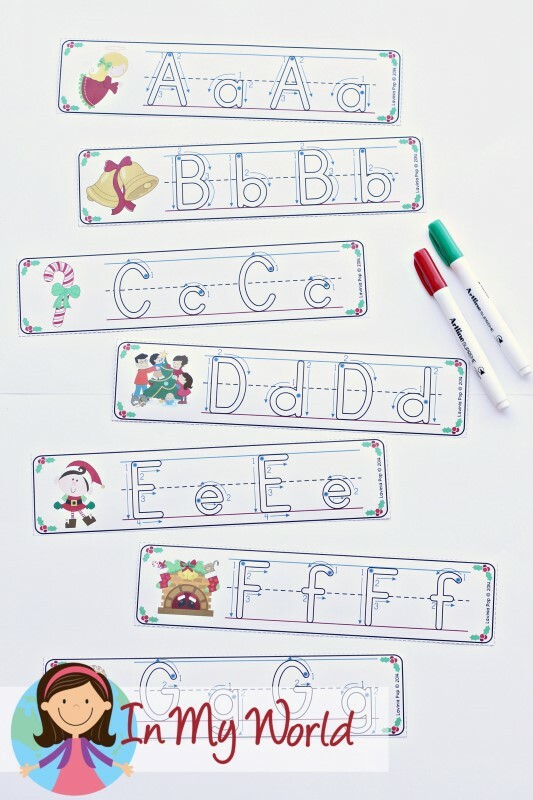 To prepare this activity for use, print the Christmas stocking cards, laminate them and then cut them out. The aim of this activity is for children to collect the letter tiles shown on each card and arrange them to build the word for each picture. Print, laminate and cut out all the cards. You will need to supply children with a paper clip and a pencil to make a spinner. Children being by laying out in a row the red header cards. They spin the pencil spinner on the reindeer spinning card and read the word where it stops. Children then find a matching rhyming picture and place it under the brown card it rhymes with. This continues until all the cards have been used up. To prepare this activity for use, print the lists, laminate them for durability and then cut them out. The aim of this activity is for children unscramble the letters on each card to make a sight word from the Dolch Pre-Primer or Primer list. Once a sight word has been built, they record it on the page included. 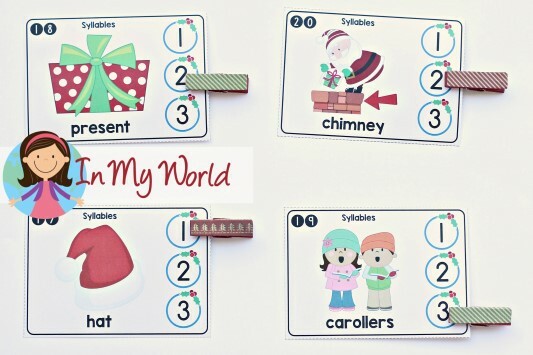 Print the sentence strips and picture cards and then laminate them for durability. Cut along the dotted lines to separate them. The aim is for children to read the sentence and then find the matching picture. Print and laminate the picture cards and labels. Attach velcro dots to the back of labels and empty boxes on the picture cards. The aim of this activity is for children to label the pictures by placing the correct word in the empty boxes. As usual, there is a black and white alternative to the Christmas Literacy Centers for Kindergarten packet. 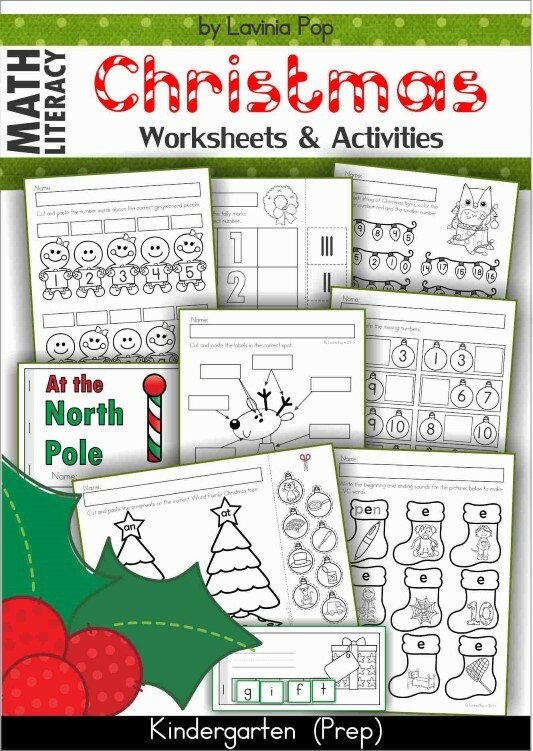 You can get the Christmas Math and Literacy worksheets by clicking the image below. I love all of these activities! Thank you so much hear are amazing! I just love your sites. Great work! You do have an awesome site.I was wondering if you have any resourses for second and third grades, especially phonics? Michelle, I’m so sorry, but I don’t have any resources for second and third grades.